Over the last few weeks, I have been leading a series of Strategic Planning sessions at the Desert Museum. 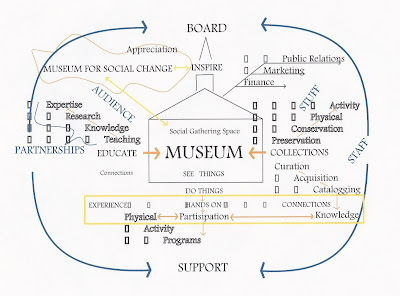 At the last session, participants and board members worked on creating a mind map of the idea of "Museum." A mind map is a graphical representation of an idea. I had planned on using the technique a few weeks ago, and then while I was at the AAM meetings in Houston I sat through a session that used mind mapping. Ah, it is still a relevant tool. Two ideas from our mind map of a museum are very interesting. 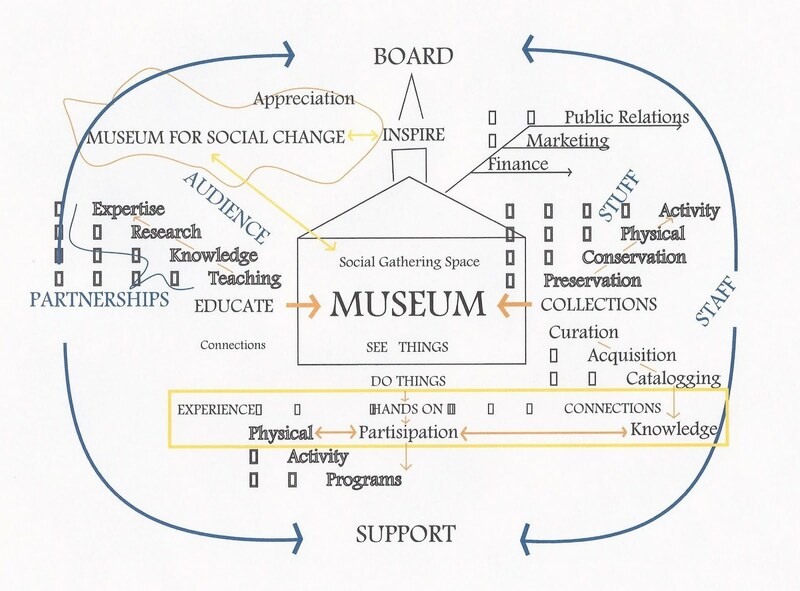 One is that the idea of a museum as a gathering place for social change can be an overarching goal of a museum. In fact, this is an idea at the center of the 21st century museum. I actually sat through a session on that at the AAM conference as well. This session was led by the past director of the National Museum of the American Indian. He talked at length of the importance of social change in the museum. The second idea is that a museum has a whole area called "Do Things." This is in opposition to what most people think about a museum, which is "See Things." I think this area of Do Things is where the museum should live. When you look at our mind map, doing things can be understood as creating Experiential Hands-on Connections. This is important, because just like the graphic we created, I believe that Physical Participation (equals) Knowledge. The mind map can be seen as just a fun exercise. As a way of getting people involved. But I love the yellow bar area of this mind map. I think it is the most important part of the museum. Love the mind map and following your blog.. Have a comment though. Educate and teach are things that you do to someone. Learning is something you do for yourself. It shifts to a visitor centred perspective. But its a Dry Heat!